A Field of Tulips in Holland is one of the masterworks of French impressionist Claude Monet. 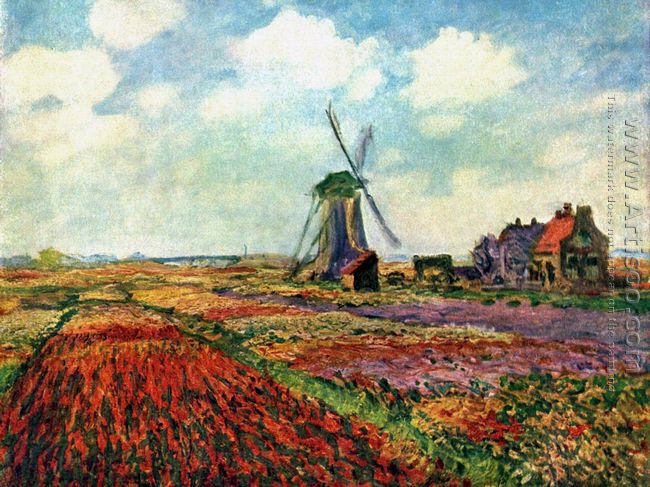 When he stayed in Hague, Netherlands in 1886, Monet found the tulip fields closed to Sassenheim between Leiden and Lisse and enchanted by the vibrancy of the fields then he painted the A Field of Tulips in Holland. It took him a lot of time to render and the use of color achieve perfect in this painting. As the founder of buy impressionism painting, Claude Monet dedicates himself to the development of impressionism and consistently practices the movement philosophy from beginning to the end. Different from the dominant official art in the 19th century, Monet is so preoccupied with light and color that he always uses color to distinguish objects instead of clear outline, resulting in diluted contours of objects in his paintings, which exert great influence on the later Fauvism and Cubism as well as Surrealism. Undoubtedly, A Field of Tulips in Holland contributes an awful lot to the tourism of Holland. Many tourists go to Holland to verify whether tulips are as beautiful as Monet depicts. Monet brings life to the tulips by successfully depicting the movement of flowers in the wind. To the left, the red and orange tulips, stand for enthusiasm and warmth, sway to the direction opposite to where the wind from. To the right, the L-shaped strip of hyathinthus adding melancholy to the scene can be seen as a balance to the ardent tulips. In addition, Monet dots patches of white and pure daffodils in the field which make the field more vivid. The wave of flowers in bloom stretches to the horizon. A polder windmill stands among the tulips with several houselets.